I absolutely love Halloween! 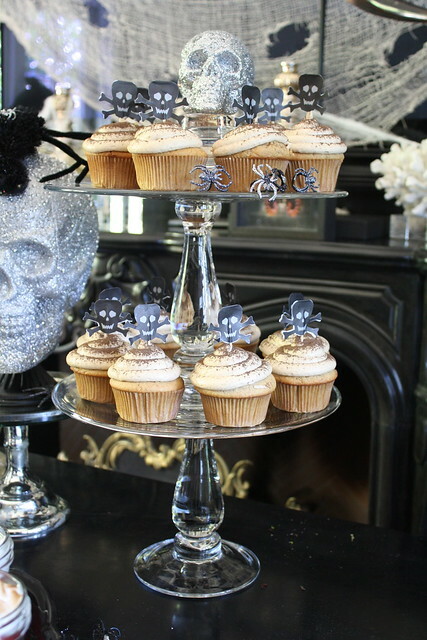 I love the costumes, the dark décor, the pumpkins, the sweets…. 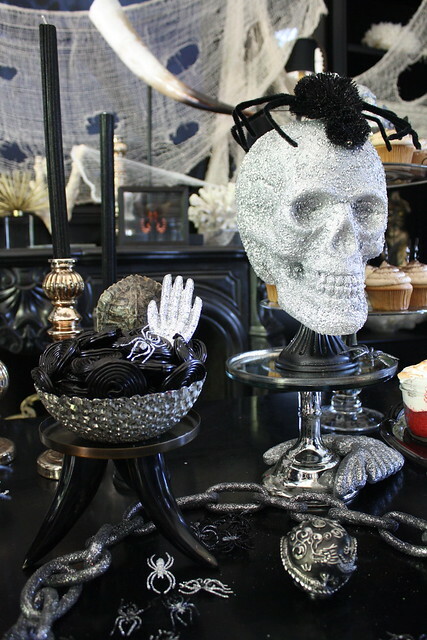 I created this dark and spooky table and decor with all of my favorite items in mind. I am not much for gore, so this was the perfect balance of scary and child friendly. I focused on a color scheme of black and natural tones, speckled with mass amounts of glitter! 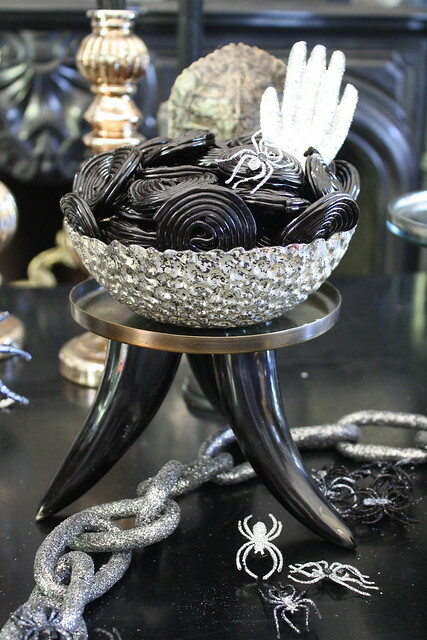 I am all about using items that you find in your own home, so you will notice that there are lots of my regular old cake plates (I just used black, silver and clear glass). 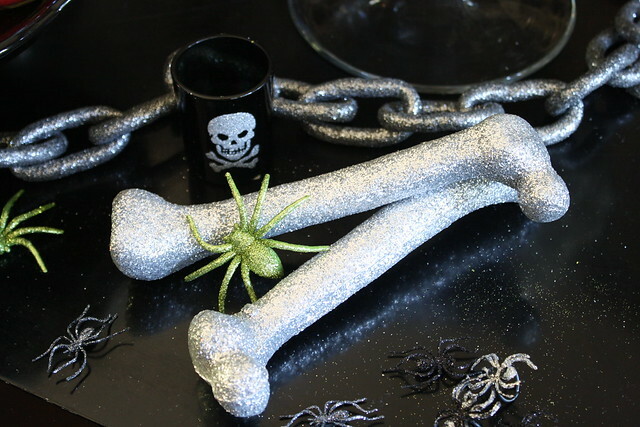 There are also black and silver dragon salt and pepper shakers, votives with a glitter skull sticker applied, and my mercury candlesticks typically pulled out at Christmas time! 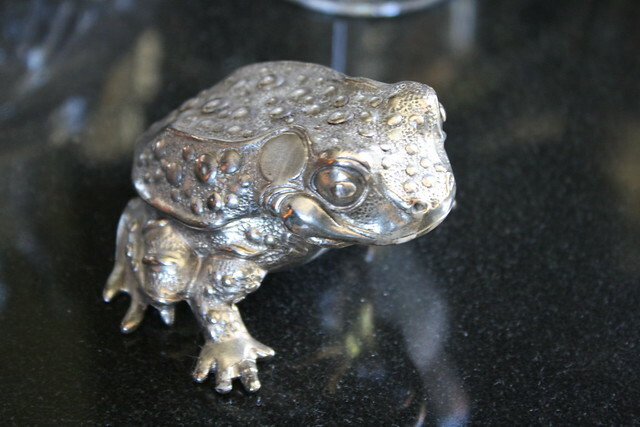 There are also some natural elements involved such as (faux) tortoise shells, ostrich eggs and other “dead” items such as coral and abandoned shells that give it a “ye olde curiosity shop” feel. (those too were rustled up from around the house). Coffee dyed and ripped cheese cloth, and spider webs hung from corners and candles to create a super creepy feel. As far as DIY crafts- there are dozens of insects I glittered, as well as skulls and bones that have been glittered. (Think craft glue, paint brushes and shades of black and silver glitter) I purchased huge bags of plastic spider rings for a few dollars and turned them into pieces of art! 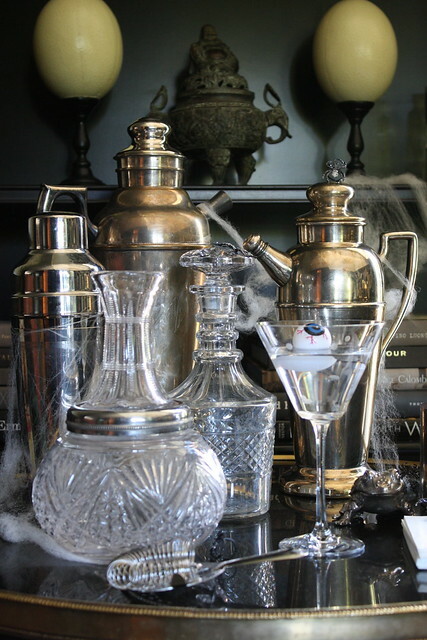 A vintage feeling bar stocked with decanters and retro cocktail shakers are watched over by a wart ridden magical toad. There are test tube vials filled with a cocktail shot made up of pop rocks, vodka and 7-up, and “eye-ball” martini’s! As far as the best part of the whole thing? The sweets! 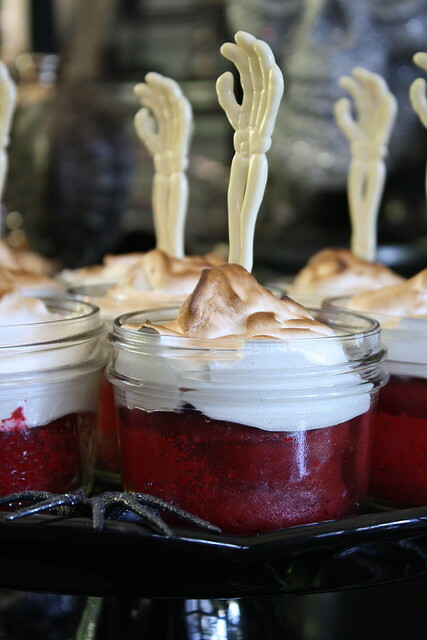 We have red velvet cakes baked in mini mason jars, and topped with toasted marshmallow fluff, complete with creepy skeleton arms crawling out of the cakes! 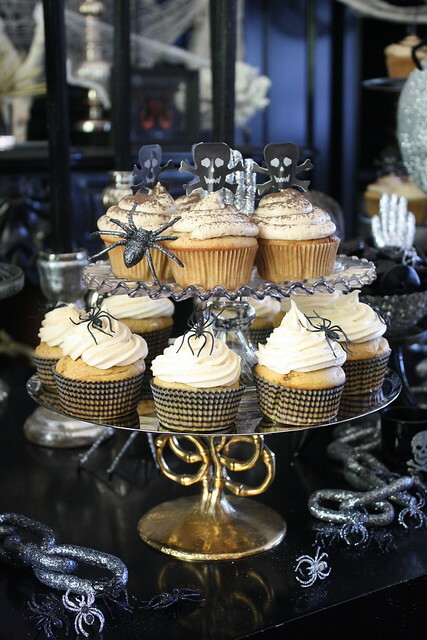 Pumpkin cupcakes topped with caramel buttercream and creepy spiders and apple cupcakes with maple frosting and skull and cross bones round out the homemade treats! 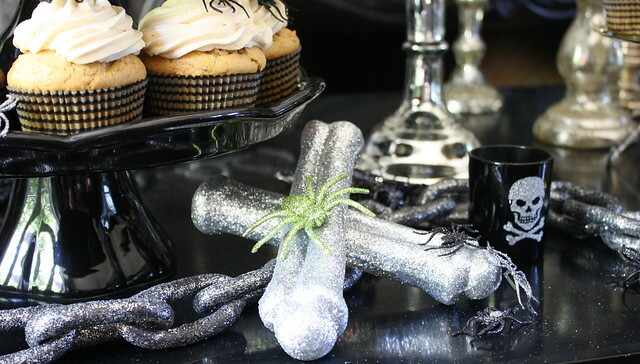 Use your Imagination, and things from around your own home to create your own wonderful spooky Halloween Table. 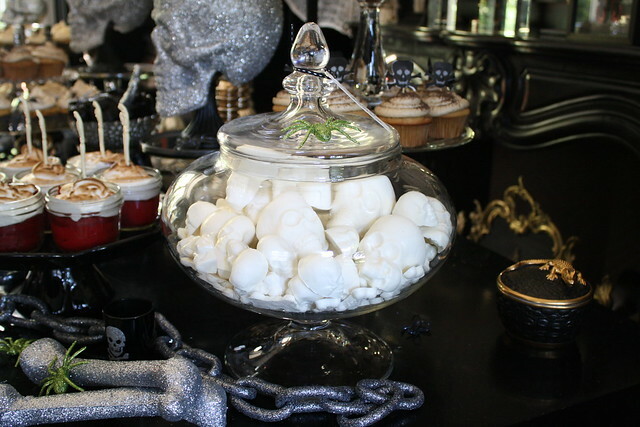 I would serve a hot steaming pot of pumpkin soup and fresh green salad before digging into this Halloween Dessert Buffet! So, if you are in the Northwest, please tune in to watch me go over this stuff live! Also, I will be posting these craft and recipe DYI instructions over the next week or so, get ready for Halloween Fun! Oh wow. This is stunning!!! You are amazing Heather!!! Gorgeous! Everything looks amazing. 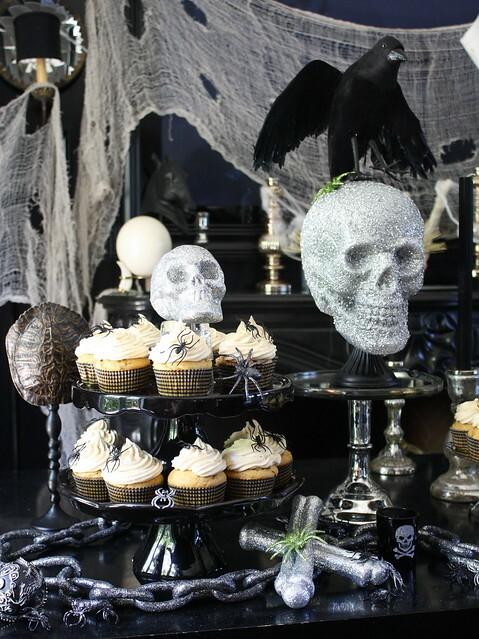 You’re making me wish I could throw a halloween party. Heather- I want to see it with a farm girl twist!! Amazing Heather, great work! I follow you often and use your recipes and entertaining ideas! Way to go! Really fantastic! Do you wake up everyday with creative ideas pouring out??!! So exciting – good luck! Once again, everything looks just beautiful – in a “halloween-y” kind of way! Looking forward to seeing all the wonderful recipes. Thanks as always for sharing your wonderful ideas! 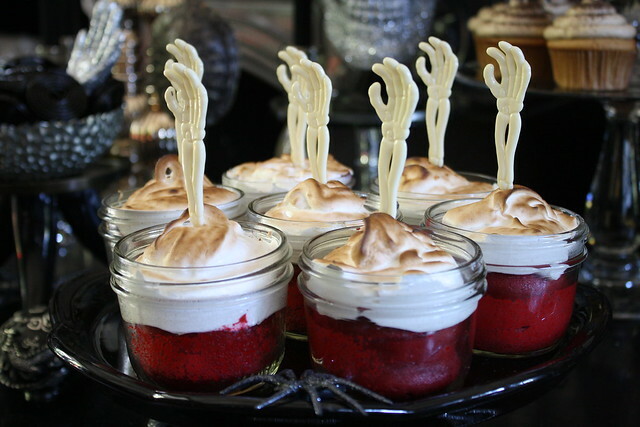 I am totally digging the lil red velvet cakes with the skeleton hands. Love those! Thanks Lucy!! I totally left it up for days so that the kids could have fun with it! You are the most creative person I know-you inspire me! Thank you for the great ideas! spoooooooooky! thanks for the ideas! Wow! 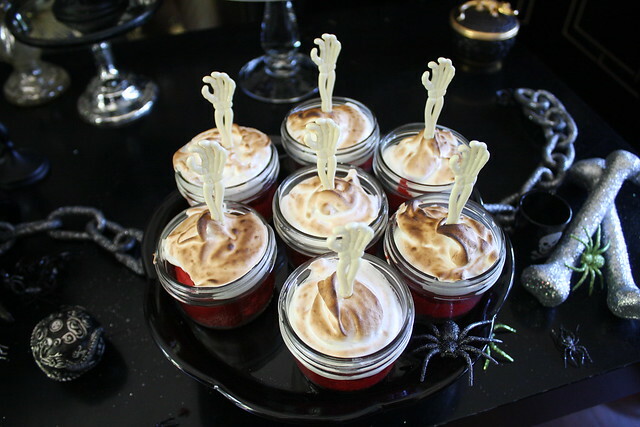 Amazing decorations – love the mini red velvet mason jar cakes … very creative! 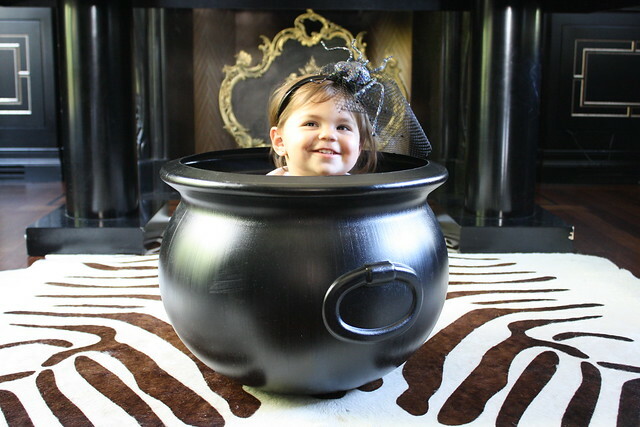 Is your little “Coco- van” going to make her appearance on the show tomorrow too, in her cauldron? SO CUTE! OMG I love this, fantastic!! Oh my gosh, fabulous. I want to come to one of your parties!!! I love it! How fun. 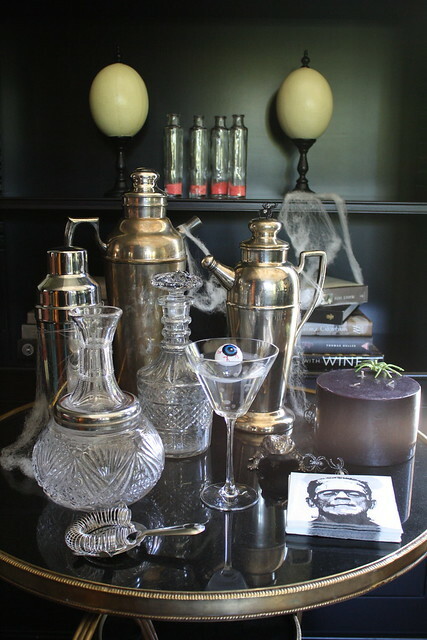 I love the aged look with the crystal and silver decanters, etc. Beautiful. Oh my goodness Heather – this is amazing!! You are so darn creative – I love all of this!!! Heather, you have outdone yourself! And I love “CoCo Vin.” 🙂 Congrats on your return engagement to KING-TV’s “Seattle Today” show! How fantastic! And congratulations to you! Unbelievable!!! What serious decorating talent! 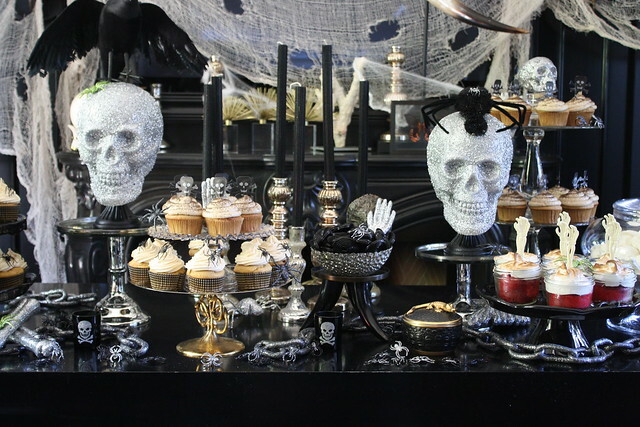 This is the most glamorous Halloween I’ve ever seen! Lol! I do Loooooove glitter! 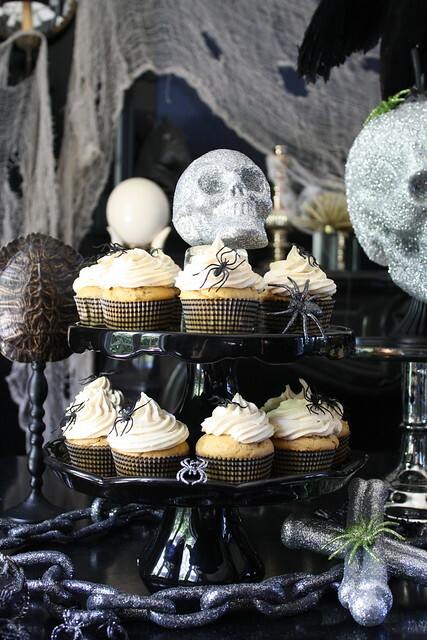 this is an “elegant-creepy” Halloween! You are so talented, Heather! How do you do it all?! Bravo to you on your appearance today on NDNW. Loved all of your ideas! 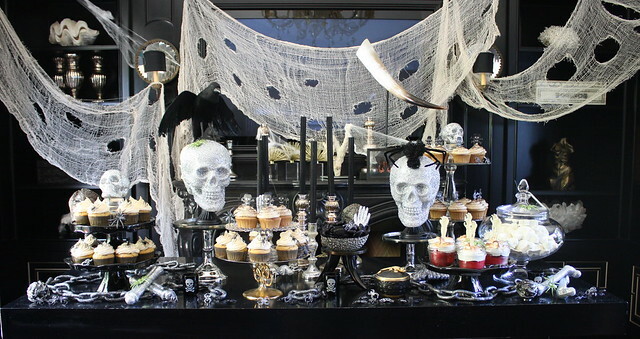 Now that’s what I call a Halloween spread. And, I have to say, “Coco-van” definitely makes it! That should be in a magazine. Gorgeous. Halloween has never looked so beautiful!! Great segment too! ahahaha! love the coco-van!!! hilarious!! I saw you on New Day Northwest. 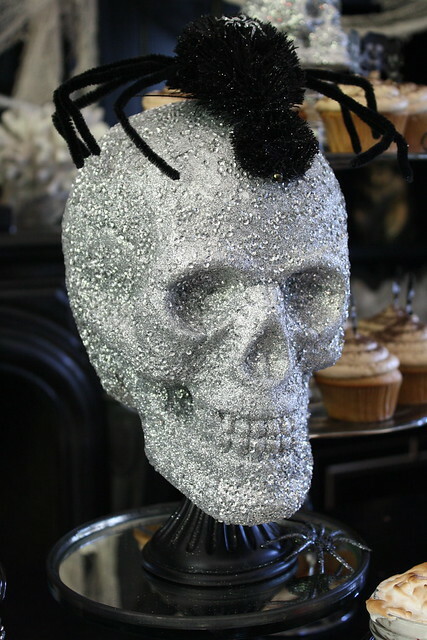 Loved your spider headpiece! Where can I go to get that giant spider and veil? Will you be posting how to make that? Thank you! all the way in italy i have been following your webpage…..you are amazing….do you do it all yourself? please, make me feel less inadequate, tell me someone helps you with the children at least!! i have two little children, 5 and 2 and they give me little time to be so creative,when i plan dinners, i work in advance….do you also do all your own photography? that as well is my passion…. Ha! Vittoria, i totally sympathize. With a 4 year old and an (almost) 2 year old- it is CRAZY around here. I do a lot of work late at night , and with my 4 year old in school this year, I still rely on babysitting to get stuff done. It is NOT easy!! I do my own photography, but I have a long way to go in that arena- I wish it was so much better! i do a lot of work at night too….i have become a night owl, and my looks are showing it….im starting a catering company here in italy based on the american themes such as babyshowers,cupcake decorating, gingerbreador do you havei love you web page…you are creative…i noticed you use a lot of natural light for your pictures….